There are a number of rose species. All are shrubby and vary from small erect to very tall climbing or twining plants. In the wild state the flower is generally single, its petals (five in number) forming one circle. Numerous yellow stamens and pistils ; woody stem, branching, with numerous prickles; leaves alternate, stalked with elongated pointed stipules and from three to seven oval, oblong, serrate leaflets; flowers showy, variable in color; fruit (hip) quite large, red color, bearing numerous hairy, hard seeds. The rose has been in cultivation for many centuries. Rose water was first prepared on a large scale in Persia. Not only was rose water used as a cosmetic and a medicine, but it was also used in cooking. Rose oil, obtained from the petals, was not known until about 1570. The great multitude of cultivated roses are all derived from a few species of wild growing ancestors. Varieties are perpetuated by grafting buds or branches on a hardy stock, as the common dog rose. It is best to graft on stocks native in the country in which it is desired to grow the variety. For example, in the United States any one of the wild growing species may be used as a stock plant. The rose is a national emblem flower of England. It is quite universally recognized as the handsomest of all flowers. The rose signifies love, joy, and prosperity. 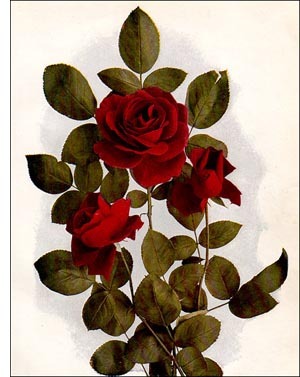 The principal use of the rose is for ornamental culture purpose. The famous rose oil (otto of rose) is used as a perfume. It is also employed for scenting snuff, hair oils, salves, and essences. Rose water is extensively used as an addition to gargles, eye washes, skin lotions, etc. The bright red hip is sometimes eaten and also used for decorative purposes. Country school children are in the habit of eating the petals and hips. The hips of the dog rose are used for making a confection. The petals are added to sachet powders.